Bunions and hammertoes may occur in some people with flatfeet. 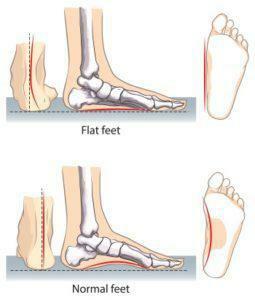 Health problems such as rheumatoid arthritis or diabetes sometimes increase the risk of developing flatfoot. In addition, adults who are overweight frequently have flatfoot. and continues into adulthood. It usually occurs in both feet and generally progresses in severity throughout the adult years.As the deformity worsens, the soft tissues (tendons and ligaments) of the arch may stretch or tear and can become inflamed. The term “flexible” means that while the foot is flat when standing (weight-bearing), the arch returns when not standing. In the early stages of flexible flatfoot arthritis is not restricting motion of the arch and foot, but in the later stages arthritis may develop to such a point that the arch and foot become stiff. standing to give your arches a rest.